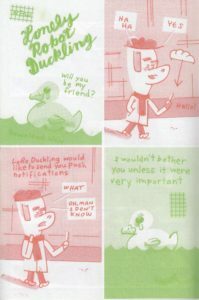 This was the comic that was free on Free Comics Day a couple of months back, so I’m honestly not sure if you can get it online anywhere or not. Check the website and e-mail somebody, otherwise check out your local comic store to see if they have any left, because it’s a great piece of work. The idea is to showcase all of their artist’s best work and they pull this off beautifully. Sure, Sam Henderson could have had more than a page out of his sketchbook, and I would have liked to see more out of Steven Weissman than a cover, but overall everyone associated with the company (again, check the website, as I’m too lazy to type everybody in) had either a good or a great short story in here. There were links to everybody in the book as well, meaning that anybody who picked this up randomly could find whoever they liked best, and that’s the point of this book. Kudos on a job well done, and I’d have to think that this did a better job of promoting the medium than almost anything else could have. After all, it was free! I could go on and on and tell you that the proceeds for this go to a great cause, and one that is vastly important to free speech in general. But if you want to know why Dirty Danny and Ted Rall are in court these days, you should go to the homepage of Danny Hellman and see for yourself. Or I could run down the stories and tell you what I thought of each one. Instead of wasting your time with that, if you read all about the lawsuit and still don’t think you should give money to this guy, I’ll just let you know who’s in this benefit, and this collection of talent should pretty much speak for itself. Tony Millionaire, Sam Henderson, Robert Crumb, Art Spiegelman, Renee French, James Kochalka, Marc Bell, Johnny Ryan, Steven Weissman, Ron Rege, Doug Allen, and Spain, among MANY others. I hadn’t seen most of the stuff in here, although I don’t know if it’s pulled from other stuff or mostly original. Whatever the case, it’s all really good, and I’d never had a chance to see Danny Hellman’s stuff before this and I like it quite a bit. Did I mention that this is over 250 pages? What the hell are you waiting for? Note: The following is from Ben Durgin, and it was on a forgotten page here, put into limbo after a past update of the whole website. No idea how this came about or why it’s here (thank you brain, for losing that memory completely) but, as it’s a great synopsis of the actual legal case involved here, thought it best to put it on the “main” Danny Hellman page. Danny Hellman is in a bit of a rut right now. In addition to being doomed in the highly unrecognized field of comics, he is facing a $1.5 million lawsuit. Well, we’re four years into this mess, and since the fall of 2001, I’ve had a wonderful lawyer named Erik Jacobs handling my case pro bono, says Hellman. For me, as a struggling artist, the most emotionally devastating aspect of the lawsuit was the expense, and thanks to Erik, these last two years of the lawsuit have been a lot less stressful for my wife and I than the first few. The lawsuit is over an e-mail prank Hellman circulated and a cartoon he drew of fellow comic book author Ted Rall. Rall had written an article for the Village Voice boldly criticizing Art Spiegelman, the well-respected, Pulitzer Prize-winning author of Maus. Hellman says the cartoon that he circulated came out a day or two before the prank. The cartoon consists of Rall drawn as a small dog in a park, peeing on a statue of Spiegelman. The prank came after Rall and Hellman exchanged several private e-mails about Rall’s Village Voice article. Hellman says he found Rall’s e-mails to be snide and decided to write an e-mail mocking Rall’s article. The e-mail, which is entitled Ted Rall’s Balls, featured a faux Rall bragging about his testicular fortitude, which he earned by criticizing Spiegelman, the chain-smoking Napoleon of comics. The e-mail welcomed it’s recipients to join a list serve where the topic of discussion would be Ted Rall’s balls. Hellman says he sent the email to approximately thirty people, most of whom were already well-acquainted with his juvenile jokes. Rall was also included on the list. That e-mail was followed by a series of faux disgruntled responses from well-known voices in the publishing industry. They were actually written by Hellman himself. Within a couple of days of the Ted Rall’s Balls e-mail, I was receiving cease & desist letters from Rall’s attorneys, threatening legal action, and demanding an apology, as well as a five figure sum of money, he explains. I provided an apology immediately, but declined to offer any cash, (as I felt none was deserved). Within a few weeks, Rall’s attorneys filed a $1.5 million dollar libel suit against Hellman. In Hellman’s opinion the whole prank was completely harmless. Regarding Rall’s article about Spiegelman, Hellman says, The Main thesis of the piece, (as I remember it) was a dark portrait Rall struggled to paint of Art Spiegelman as a petty, power-mad tyrant of the New York cartooning scene, without whose consent no aspiring cartoonist could ever hope to advance professionally. Hellman says Rall even attacked Spiegelman’s smoking habits. Danny Hellman isn’t a millionaire who can easily pay a settlement to Ted Rall. So he has put out a benefit book called Legal Action Comics Volume 1. 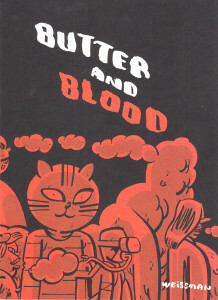 The second volume of his anthology is also available .I’d wanted to do a comics anthology for years. And had tried a few times to get such projects off the ground, with little success, says Hellman. 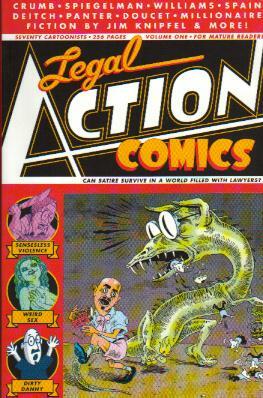 I had done a mini comic in the early 1990s called Legal Action Comics, which reprinted two strips I’d done for Screw magazine parodying Superman and the Simpsons. So in a sense, there were precedents that led to 2001’s Legal Action Comics Volume 1, but I’d certainly had no plans to print such a book prior to the lawsuit. 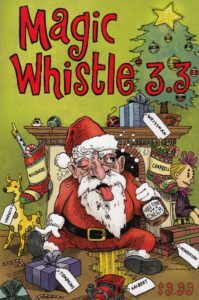 The anthology contains work from some very well-known people in the world of comics such as Robert Crumb, Sam Henderson, and Art Spiegelman. The second volume contains some returning contributors from Legal Action Comics Volume 1 and some new talents as well. Hellman also has gotten some help from M. Doughty, former front man of the band Soul Coughing, whom he calls a very gifted writer (as one can tell from his lyrics). Hellman says he got acquainted with Doughty a few years ago at the New York Press offices, and at the newspaper’s legendary lavish parties. Doughty had been a writer and an illustrator for the paper for several years. Hellman says that Doughty was possibly the funniest writer the New York Press ever had. When I got into legal hot water, Doughty and his band Soul Coughing were generous enough to headline a benefit concert the New York Press had organized on my behalf. (Soul Coughing disbanded shortly after that December 1999 concert, and I’d like to think that the sight of me in clown makeup had nothing to do with that breakup). Danny Hellman doesn’t have any specific plans for the future. He says he has made a living as an editorial illustrator and hopes to have continued success in that field. I enjoy doing comics, and hope to do more of that, in spite of the meager financial rewards and limited audience. Perhaps he’ll continue to get by with a little help from his friends.